Join us for a week of hands-on STEAM (Science, Technology, Engineering, Art, Math) challenges February 17- 23. The Museum will celebrate National Engineers Week with age-appropriate activities that provide open-ended exploration and discovery opportunities for families. Draw a flying machine inspired by comic artist Jerel Dye. Join the DevTech research group from Tufts University to engage with and give feedback on CRISPEE, a tangible tool designed to introduce young children (grades K-2) to foundational concepts of bioengineering. This program is generously supported by BNY Mellon and National Grid. Explore circuits and basic music concepts by using a simple computer program, imagination, and some bananas, to make music. Have you ever seen someone go down a zip line? Today, try to build a cart that will travel down several zip lines without it coming apart. Be an environmental engineer and try to figure out the best way to clean up oil that has spilled into the ocean. Build your own circuits with batteries and bulbs, and explore what kinds of materials conduct electricity. Learn the basics of coding using nothing more than magic markers, and an adorable little robot. 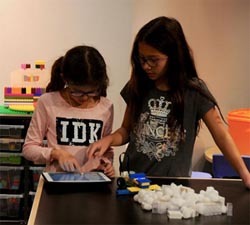 STEAM subject matter infused with an informal, hands-on, playful approach make these activities accessible and fun, and will provide opportunities for rich interactions between adults and children.